In what will be the third meeting between the Spanish giants, Real Madrid will host Barcelona in the second leg of the semi-final at the Santiago Bernabeu on Wednesday. 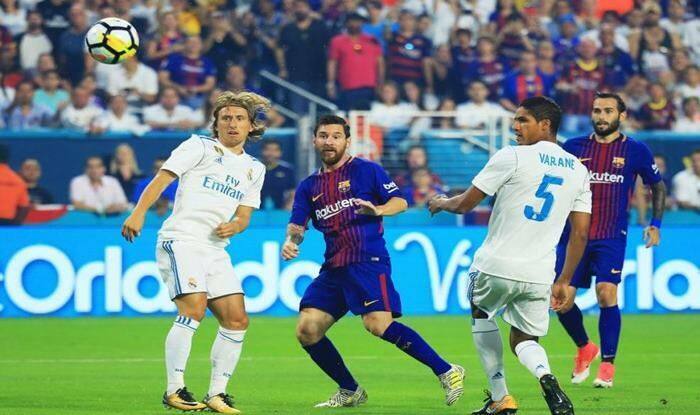 El Clasico Real Madrid vs FC Barcelona Live Streaming of Copa Del Rey 2019 Second Leg: In what will be the third meeting between the Spanish giants, Real Madrid will host Barcelona in the second leg of the semi-final at the Santiago Bernabeu on Wednesday. The first leg of the fixture which was held at the Camp Nou stadium ended in a 1-1 draw. In the match, Lucas Vazquez scored the opener in the sixth-minute following which Malcolm found the back of the net to equalise for the Catalan club. Pressure is mounting on the defending European champions Real Madrid, who recently suffered a 2-1 shock defeat at home to minnows Girona and scrambled a late victory against Levante on Sunday in a match which drew much controversy. The ‘Los Blancos’ have won the competition just once since 1993, and a much-needed win against Barcelona could potentially change the fortunes for the season to come. The Santiago Solari-led could still have a positive season if they go on to clinch the Copa Del Rey. They are also still in contention in the Champions League. Barcelona are reaping the benefits of an underperforming Real Madrid in the league as they lead the table with a comfortable distance but Valverde and his men will aim to do a double in Spain by retaining the domestic cup title again this season – they have lifted the Copa Del Rey in each of the last four campaigns. Lionel Messi and his team will head into this crucial tie at the wake of an impressive 4-2 victory over top-four rival Sevilla in the weekend. This match will also mark Valverde’s 100th match as Barca coach and will be eying the fourth trophy under his regime. What time will the second leg of Copa del Rey semifinal between Barcelona vs Real Madrid take place? Where is the second leg of Copa del Rey semifinal between Real Madrid vs Barcelona? The second leg of Copa del Rey semifinal between Real Madrid and Barcelona is at the Real Madrid’s home, Santiago Bernabeu Stadium in Madrid. Which channels will broadcast the second leg of Copa del Rey semifinal between Barcelona vs Real Madrid? The second leg of Copa del Rey semifinal between Real Madrid and Barcelona channel details will be updated. The first leg of the fixture was not broadcasted and there is no confirmation on the broadcast of the second leg yet. However, online streaming is available on Jio Tv’s Jio football channel. How do I watch the free online streaming of the second leg of Copa del Rey semifinal between Barcelona vs Real Madrid? The free online streaming of the first leg of Copa del Rey semifinal between Real Madrid and Barcelona can be watched for free on Jio Tv official app in India. The fixture will mark the 240th El Clasico encounter. Real Madrid leads the head-to-head record with 95 wins to Barcelona’s 93. The remainder of 51 matches have ended in draws. The first leg of the fixture ended in a 1-1 draw and prior to that Madrid took on Barca in this competition in the final of the 2013-14 season and lifted the cup with a 2-1 victory. Prediction: Real Madrid 1, Barcelona 2.